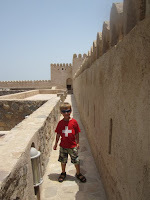 Our Wandering Family: Exploring Musandam and The "Fjords of Arabia"
Exploring Musandam and The "Fjords of Arabia"
In some parts of the world two days' stay may not seem like much, but in the sweltering heat of The Sultanate of Oman, it's enough to move mountains. Okay, well maybe not to move them, but certainly to circumvent them, in our case via traditional Arabic Abra along the "Fjords of Arabia". The company Khasab Tours, which has an office in the lobby of Khasab's main hotel (Golden Tulip Khasab), made this incredible journey possible. En route to stunning Telegraph Island our guide, young Mohammed, shared stories about children rushing to greet visitors on the shores of remote local fishing villages, and talked about the community at the tip of the Musandam Peninsula where residents speak a language which is neither English or Arabic. We anchored at Telegraph Island itself and were given plenty of time to snorkel amidst the tiger fish and swim ashore for photos. 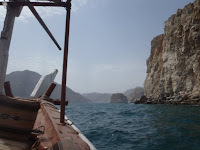 Since it's off season in Oman now, we were on our own out there for most of the morning, with the main passersby being Iranian smugglers in speedboats and local fishermen. 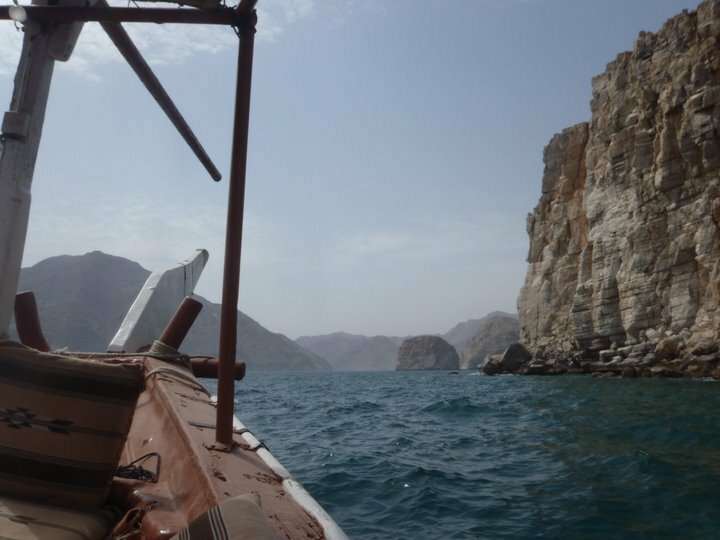 Many villages here are reachable only by boat and have no streets or cars, and children who wish to attend school must be sent away to Khasab's boarding school. Apparently, local women prefer to live in Khasab in the summer, returning to their remote fishing village for the winter. It's a fascinating lifestyle, and a taste of the Middle East that is hard to find in the ever-expanding metropolitain cities of the UAE. 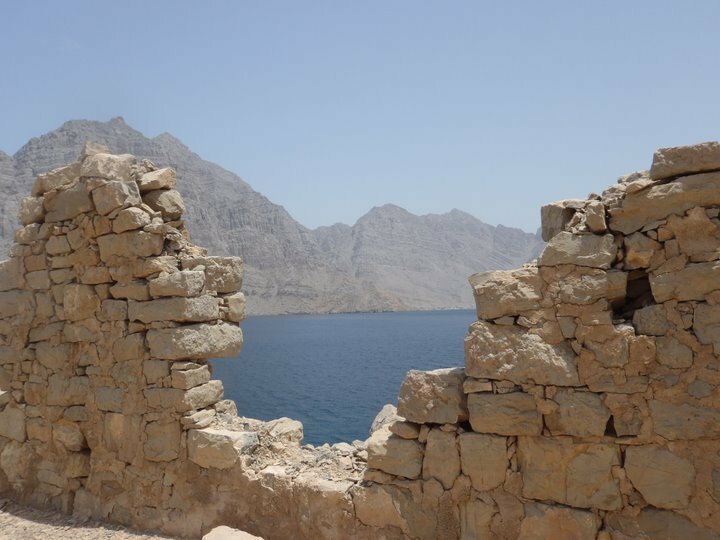 Another great tribute to the culture of Musandam is Khasab's Fortress and Museum, which has a well done film and over a dozen displays showcasing local life and traditions. Even our four-year old loved it! On the afternoon following our boat tour we wandered around the hotels' rocky shore, spotting dozens of crabs. Though we were out there for less than 20 minutes, we began to feel as though the heat was literally consuming us. The solution? Jumping into the pool fully clothed of course! Oh my was that fun! I went first and Lukas followed, and that single - slightly crazy- spontaneous act made me feel like a kid again. 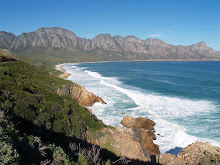 Perhaps it's Khasab's Fountain of Youth. Along with the incredible sights, we witnessed much poverty, dozens of sick and seemingly stray goats and cats, and the level of tolerance towards "inappropriately dressed" western women is significantly lower than that of Dubai. But that's part of what makes it so appealing. That and the fact that, here, in this incredibly hot and arid region, life goes on. It's like seeing life on the moon, or at the very bottom of the sea. The odds are against them, yet I've seldom seen such persistance and determination. 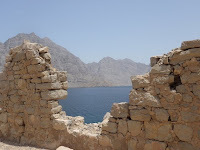 Indeed, just going outside in such a climate requires ambition, and this is something that the people of Musandam have no shortage of. It's Esther from pregnancy class two years ago:) How are you? We are trying to plan a playdate for all the kids to celebrate their 2nd birthday (like last year). I've mailed you a datumprikker but I don't know if you got it. Would you like to join us? We want to meet on juli 31st in the morning, at a playground or something.